Service Oriented Architecture (SOA) is a compelling topic in Service-Oriented Computing (SOC) paradigm nowadays, as many requirements come from inter- and intra- enterprise service composition. However, as one of the most significant principles of service orientation, service autonomy, has not been addressed systematically. 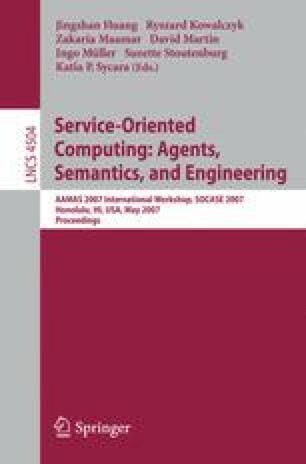 In this paper, we propose a feasible solution for service autonomy through analyzing its intrinsic characteristics. Firstly, from the service lifecycle management point of view, a three layer architecture of service autonomy is designed, based on which a service agent is built to provide core autonomous service functionalities, including automatic service discovery, proactive service monitoring, decentralized service orchestration, and just-in-time information sharing. Second, XMPP (eXtensible Messaging and Presence Protocol) is employed to construct a lightweight fabric of agents. Finally, three typical use cases of web service composition are used to validate the rationality and feasibility of the proposed solution for service autonomy.